Founded in 1988, Lao She Teahouse (Laoshe Chaguan) is named after Mr, Laoshe, a famous artist in China, and Tea House, one of the famous novels he wrote. 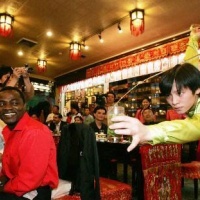 With service area of more than 2, 600 square meters, the teahouse provides an antique-flavor, Beijing-styled environment, where you can watch wonderful performances by celebrities from folk arts and drama on any given day while enjoying famous teas, palace snacks as well as traditional Beijing flavor snacks, regales and tea banquets. Nearly 50 foreign heads of state, numerous celebrities and more than 2.5 million Chinese and foreign tourists have visited Lao She Teahouse since it was founded. 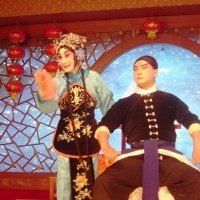 It has been a window for exhibiting the national culture and bridge that connects China with the rest of the world. Qianmen Courtyard Teahouse is another entirely new offering through which Lao She Teahouse promotes Beijing culture and the Chinese tea culture. It is in the form of a courtyard house, a kind of ancient, classic traditional building in Beijing, with the tea art at its core. They have created a graceful, Beijing-unique tea art house that you can only dream about. Here you feel nothing but leisure, tranquility and ease. 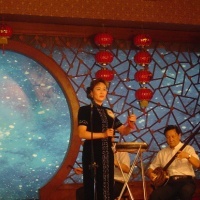 You may listen to melodious music from Chinese zither, watch wonderful tea art performances, enjoy different style opera, watch Chinese Shadow Puppet Show, and sip fragrant tea and enjoy the leisure brought by tea. Hi Amy, their numbers are: 010-63021717/63036830. I suggest you'd better make a reservation before going there because their bussiness is always good.